I will analyze the OECD data for non-linearity using the entire time series. This gives me the opportunity to work around some of the limitations of having so few countries in any given year and in a relatively compressed range of at that. Further, I will exclude the United States from training data because it is presumably the only country that doesn’t have health care reasonably well figured out and I will exclude Luxembourg because it has a very large non-resident workforce (which skews per capita estimates in both dimensions). I will fit this with a 3rd degree polynomial since that appears to fit the broader 2011 WHO/WorldBank data better without the overfitting potential of loess (especially amongst the tails). Note: the blue line is the loess smoother for the entire series whereas the green line is a 3rd degree polynomial, excluding US and Luxembourg from consideration, extended out across the entire plot (to include area covered by US etc). The lines look very similar and the US trend is quite close! Alternatively, we can fit a 3rd degree polynomial across the entire series and view the progression by country. The observed patterns by country are generally quite consistent with the polynomial trend, i.e., it does not look like this is purely an artifact of between country differences. Now if I actually train these models on the reduced data set, i.e., excluding USA and LUX, you can observe that the polynomial models (2=2nd degree, 3=3rd degree) perform better than the linear specification (model 1). You can also see that the 2nd term in both polynomial specifications is quite clearly statistically significant too [all terms are highly significant with complete data set]. Even without year effects the polynomial models explains ~91% of the variation. Note: The redline is the local trend within any given year whereas the black line corresponds to the actual-vs-predicted values (slope=1). You might note that, despite the fact I’m not correcting for year effects/time, the model generally holds up quite well, e.g., mostly falls very close to the overall expected slope across most years….. The US does not look like an outlier here. The trend in annualized residuals appear to be modest, maybe 300 dollars over the course of 40+ years. This would tend to suggest that increasing material conditions can explain most of the observed increase in HCE amongst OECD countries over time. I also found the polynomial model outperforms the linear model, both with and without year fixed effects (allowing the intercept for each year to vary independently), and that the 2nd polynomial term remains significant even with year FE. Moreover, if I instead model the observation year as an integer, so that it behaves as a continuous variable, i.e., assuming an approximately continuous trend of increasing HCE across the board and thereby reducing the degrees of freedom significantly (relative to year FE), I get similar results, i.e., modest annual changes controlling for AIC and the polynomial model specification reduces the apparent effects of time (from, say, technological innovation) even more. Along similar lines, if I explicitly include country fixed effects to crudely try to estimate the marginal influence of AIC within countries over time, I still find good evidence for non-linearity in the slope vis-a-vis AIC. The US looks on a bit on the high side, BUT rich countries skew high systematically too! Another way to come at this issue is to look closely at the residuals in a linear model in several dimensions (e.g., across time, across differences in AIC, etc). Although that is about what I would expect given the apparent non-linear relationship with AIC and the particular distribution of AIC here. Clearly this model has some significant systematic error if you look closely at it by AIC. Alternatively, if I model this with a random effects model (lme4 package) wherein each year is allowed its own intercept and its own slope vis-a-vis AIC, I find the slope varies quite strongly with time. This is entirely consistent with the polynomial model and a general trend of increasing AIC across most countries. In any event, we can still pretty clearly see that these residuals are not distributed randomly vis-a-vis AIC. In short: why is this not all much better explained as an overall non-linear relationship (as in the 3rd degree polynomial models above)? Note: That is not to argue that technology had played no role here, I think it has, but it seems to be pretty modest as a root cause or independent predictor (as suggested by the annual coefficients ) as compared to the influence of increasing affluence in the US and abroad. 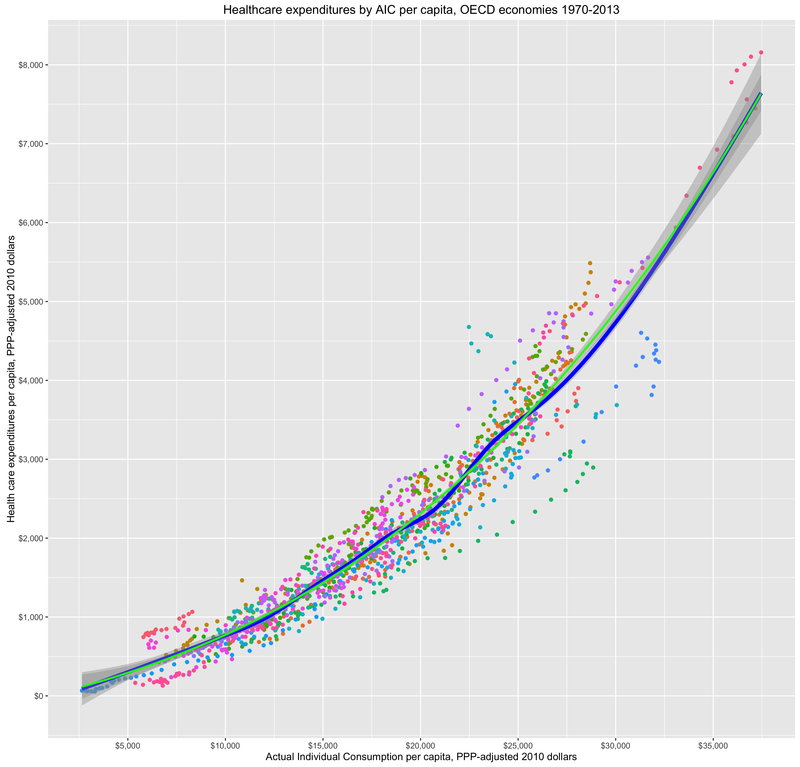 Put differently, spending on new technology (or otherwise stimulated by it, e.g., diagnostics) may account for a significant fraction of the increase in spending in rich countries, but this doesn’t usually seem to happen all that significantly without a larger corresponding increase in broader consumption measures (i.e., even if you exclude HCE).